Our expandable braided sleeving provides mechanical protection and abrasion resistance for wiring harnesses. The special braid construction permits the sleeving to be expanded by up to 300% which allows for easy fitting over components. The monofilaments resist attack by salt water, oils and most common fuels and solvents. The high bore expansion and retention of roundness makes the sleeving ideal for use in the manufacture of wiring looms, especially where cables are connected to moving parts and are constantly flexed. 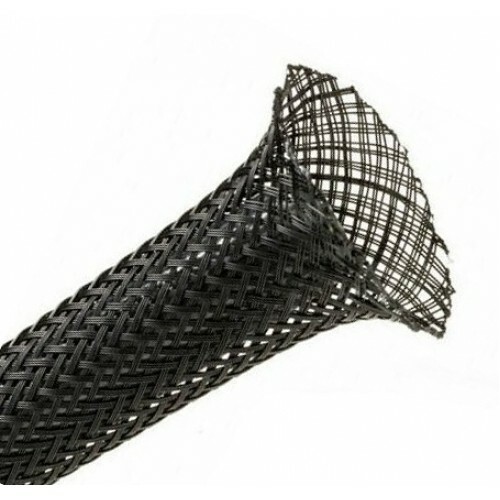 Expandable sleeving is used extensively as a harness sleeve, with the open construction of the braid allowing branch terminations to be made through the sleeve wall, which greatly speeds manufacture. It is cut utilising the hot melt method. This melts the monofilaments during the cutting action, bonding the braid crossover points and preventing fraying of the cut end. UL Rated braided polyethylene terephthalate monofilaments. Operates at temperatures within the range -70°C to +150°C. Excellent resistance to damage by mechanical abrasion and repeated flexing.